There is no questioning the significance to twentieth-century industrial design of the Ericofon telephone, whose one-piece design makes it a predecessor of both cordless telephones and cell phones. Introduced in the United States in 1956, the Ericofon was originally conceived by Ralph Lysell in 1941 and was redesigned by Lysell, Hans Gösta Thames, and Hugo Blomberg for L.M. Ericsson a few years later. A pioneer of Swedish industrial design, Lysell ran an innovative consulting company in Stockholm during the 1940s. Like cell phones today, the Ericofon was designed to offer consumers convenience, efficiency, and style. With its cobra-like shape, the Ericofon’s inventive form considered how people actually held their telephones—often not by the handle but by the mouthpiece. The size of its base, incorporating the rotary dial on its underside, was designed to accommodate a variety of different hands and a conspicuous thumb grip was placed on it to subtly suggest the proper way to hold it. Additionally, the Ericofon was designed to avoid having the receiver accidentally left off the hook. When the phone was lifted off a flat surface, a pressure-sensitive switch on the underside would release to connect and produce a dial tone; it would automatically hang up when the phone was put back down. 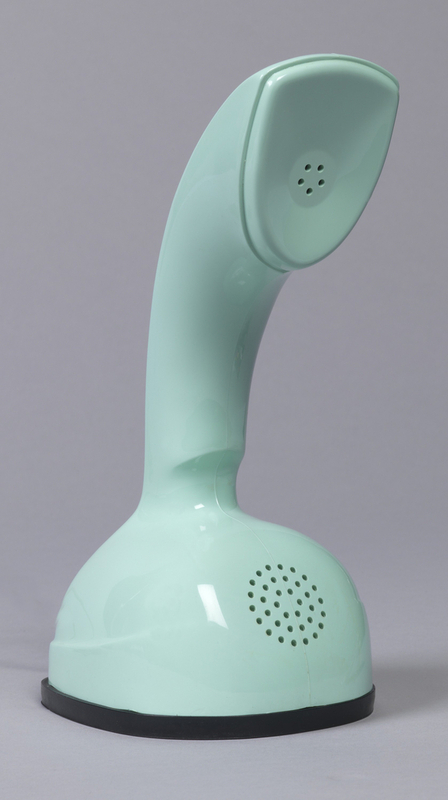 When the Ericofon made its debut at the United States Independent Telephone Association’s annual convention in Chicago in 1956, it was praised for its functionality and unique lightweight design. The Ericofon was originally offered in five colors: white, beige, pink, green, and blue. Soon after its debut new colors were added, such as “Wedgewood Blue,” “Princess Pink,” and “Persian Gray.” By the early 1960s many of these colors were discontinued, reflecting how rapidly interior fashions changed. The Ericofon’s design exhibited a sympathy for its surroundings­ difficult to imagine in the design of cell phones today. Colorful advertisements from the late 1950s show the Ericofon being used in both traditional and modern interiors. A 1958 advertisement for the Ericofon reads, “Architects, interior decorators, designers and style conscious home-makers have acclaimed the Ericofon as the first truly decorative phone.” Although the once-intimate relationship between telephone design and interiors is fading away today, the desire for novelty and color still remains. “Display Ad 25 — no Title.” Chicago Daily Tribune (1923-1963) Oct 14 1958: 1. ProQuest. 22 Oct. 2016 . This color was marketed as “Aqua Mist”. Your site should include a photo of the dial too. Very unique.